the vein that returns the blood from the placenta to the fetus; traversing the umbilical cord, it enters the fetal body at the umbilicus and then passes into the liver, where it is joined by the portal vein; its blood then flows by way of the ductus venosus and the inferior vena cava to the right atrium. one of three embryonic vessels in the umbilical cord. It functions to return the blood from the placenta and fuses to form a single vein in the umbilical cord. Returns the blood from the placenta to the embryo; traversing the umbilical cord, it enters the embryo body at the umbilicus and then passes into the liver, where it is joined by the portal vein; its blood then flows by way of the ductus venosus and the inferior vena cava to the right atrium; the right umbilical vein disappears during the seventh week. Synonym(s): vena umbilicalis [TA] , umbilical vein. used in calves and foals for the closed method of herniorrhaphy. Consists of two lightweight bars that can be screwed together very tightly. The herniated gut is evacuated from the hernia and the clamp applied to as much of the hernial pouch as can be included. The tissue beyond the clamp sloughs and the clamp can be removed. an evagination of the bowel wall at the vestigial point of attachment of the yolk sac. Called also Meckel's diverticulum. umbilicus infected with Clostridium septicum, C. oedematiens. a specific syndrome in newborn piglets. Bleeding from fleshy navel, also from ear notching, causes fatal anemia. The cause is unknown. protrusion of abdominal contents through the abdominal wall at the umbilicus, the defect in the abdominal wall and protruding intestine being covered with skin and subcutaneous tissue. Occurs sporadically in all species and inherited in cattle and some breeds of dogs. Soft swelling at umbilicus is reducible into the abdomen through a palpable ring. May accompany omphalitis. the intestinal loop in the hernia becomes incarcerated with its lumen occluded and its blood supply compromised. as when the umbilical cord is trapped between the fetus and the wall of the birth canal, causing loss of the fetal blood supply. created by persistence of only the distal end of the intraembryonic allantoic stalk at the umbilicus. cotton tape, about 0.5 inch, with two selvedge edges. 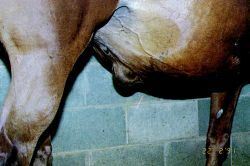 Used to tie off an umbilicus in calves and foals. one of a pair of veins which return oxygenated blood from the placenta through the umbilical cord to the ductus venosus and thence to the heart. residual after subsidence of acute omphalophlebitis. Hemodialysis fluid (HDF) supplemented with rosmarinic acid (RA) inhibited mRNA expression of pro-inflammatory cytokines in LPS-stimulated human umbilical vein endothelial cells. In these situations, the umbilical vein (which has not had blood flow) represents the fetal status prior to the occlusion event. Human umbilical vein endothelia cell (HUVEC) and human micro vessel endothelial cell-1 (HMEC-1) was obtained from the American Type Culture Collection (ATCC, Manassas, VA, USA). In this prospective study, we aimed to compare the efficiencies of the Dunn method, Shukla-Ferrara, and modified Shukla formulas, which are used to determine how far umbilical catheters should be inserted in the umbilical vein, and to determine the most appropriate method by this way. The umbilical arteries, umbilical vein were still rudimentary at this stage and was surrounded by large amount of mesenchymal cells. Omphalophlebitis omphaloarteritis and urachitis are terms used to further describe the extension of inflammation or infection from the external umbilicus to the intra-abdominal segment of the umbilical vein umbilical arteries and urachus respectively (Kasari 1993). An area of the umbilical cord is cleaned with an antiseptic solution, and a needle (attached to the collection bag) is inserted into the umbilical vein. Oxytocin injection into umbilical vein in active management of placental delivery. Lycopene inhibits angiogenesis in human umbilical vein endothelial cells and rat aortic rings. The portal venous phase of superior mesenteric vein (SMV) angiography demonstrated hepatopetal flow into the liver, no arteriovenous communication, and a large umbilical vein decompressing the portal system. The umbilical vein becomes the ligamentum teres after birth. This oxygenated blood collects in the umbilical vein, and then flows through the ductus venosus, a vascular channel coursing through the embryonic liver between the umbilical vein and the inferior vena cava.